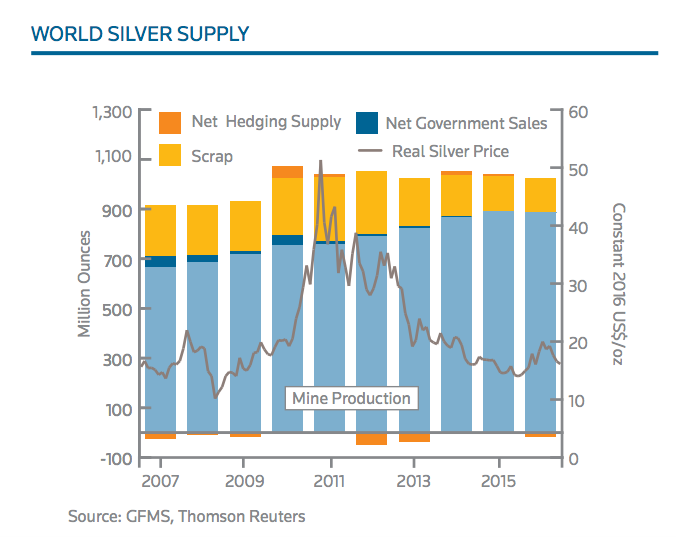 Global silver production dropped last year for the first time since 2002 driven by lower by-product output from the lead/zinc and gold sectors, as well as a sharp decline of scrap supply to the market, which hit its lowest since 1996. According to the latest Silver Institute report, released Thursday, total silver supply decreased by 32.6 million ounces in 2016 in line with decreased demand for the precious metal, with falling jewellery, coin and bar and industrial consumption contributing to an 11% drop. Source: World Silver Survey 2017. But a very positive outlook for energy technologies, which has boosted commodities such as lithium and nickel used in energy storage batteries, provided a much-needed lift to silver demand last year. Purchases from the photovoltaic industry, driven by a 49% increase in solar panel installations, jumped 34% in 2016 to a record high of 76.6 million ounces, making it the strongest year of growth since 2010. According to the study, produced on behalf of the Silver Institute by the GFMS Team at Reuters (GFMS), the jump in global solar panel installations was driven largely by growth in China and the US, where installations climbed 126% and 95% respectively. Last year’s silver supply decline of 0.6% to 885.8 Moz was mostly due to output drops at the lead/zinc and gold sectors, where production dipped by a combined 15.9 Moz, the survey shows. Mexico kept its leading position as the world’s largest silver producing country, followed by Peru, China, Chile and Russia. On a regional basis, Mexico registered the largest decline in production last year, followed by Australia and Argentina. Those losses were partially offset by gains in Central and South America, as well as Asia, the report shows. 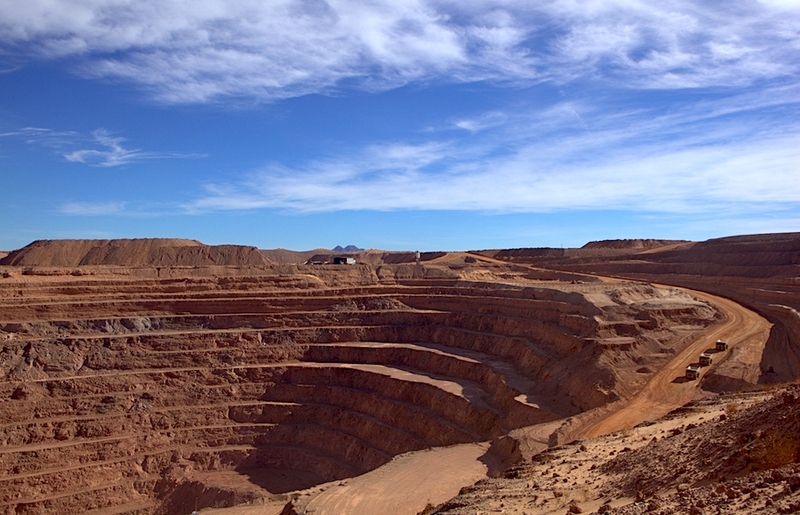 Despite the gloomy figures, Mexico kept its leading position as the world’s largest silver producing country, followed by Peru, China, Chile and Russia. Silver scrap supply fell to 139.7 Moz in 2016, a level not seen since 1996, despite higher silver prices, the study says, adding that such contraction was largely driven by lower Asian flows, due in part to lower industrial fabrication volumes. Last year was a very good one for silver prices, as they climbed 9.3% — their first rise since 2011. 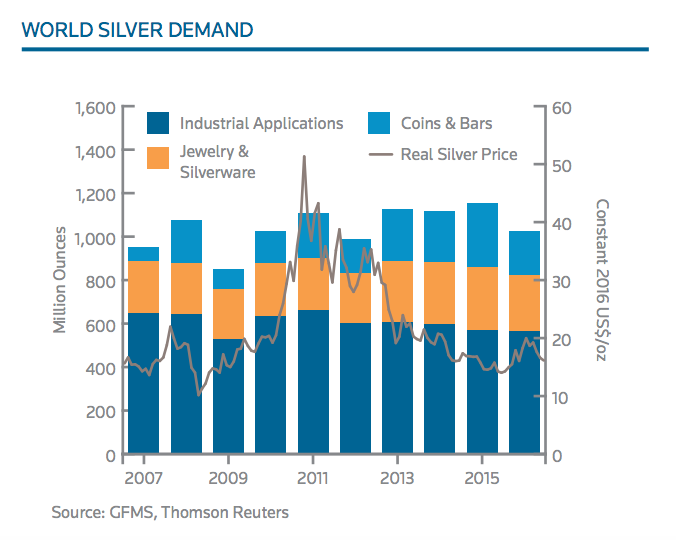 Assisting the welcomed spike was last year's supply and demand scenario, which led to another annual silver market deficit, the largest in three years and the third largest on record, reaching 147.5 Moz. 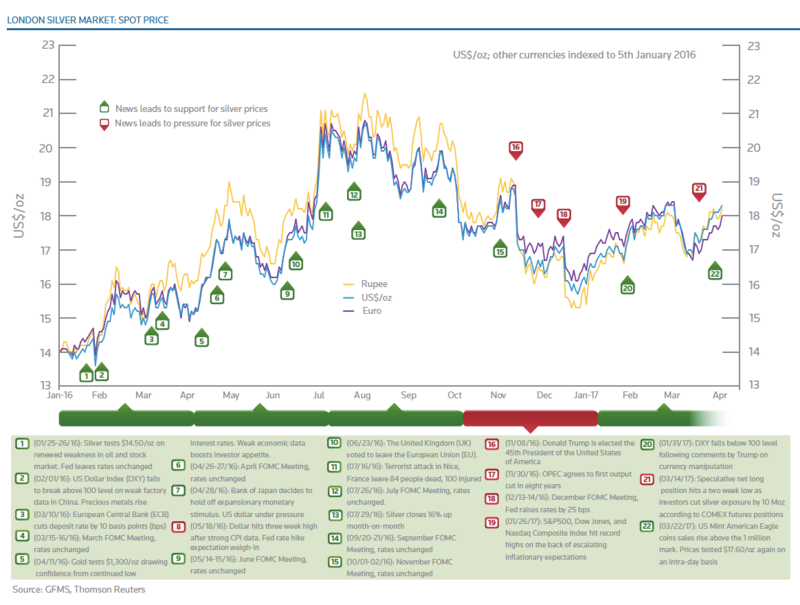 Last year’s average price of $17.14, was 28% higher than in 2007 when the precious metal traded at $13.38 average. Holdings in global ETPs increased robustly by 47 Moz last year, posting an all-time high in October. Silver coin and medals fabrication fell by 9% in 2016, from its record high in 2015, to 123.2 Moz. Total physical demand fell by 11% in 2016 to 1,027.8 Moz, pulled lower by weaker offtake for jewellery, silverware and retail investment.